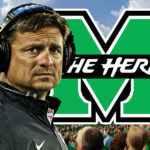 It’s only been a day since Marshall football’s offensive coordinator and tight ends coach Bill Legg resigned, but fans are already beginning to speculate on who the team’s next OC will be. 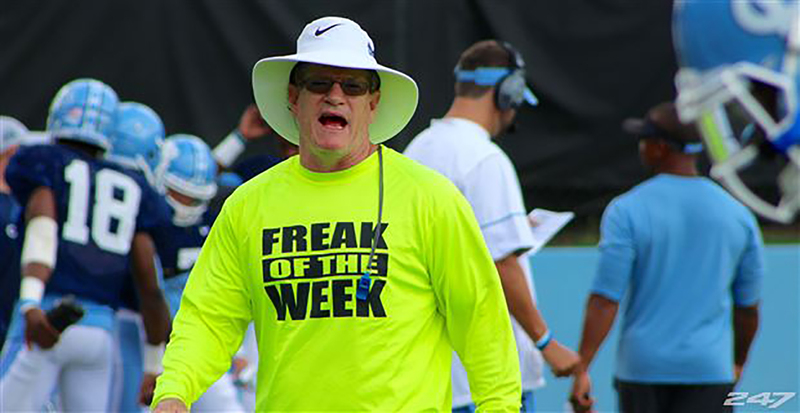 Some of the names fans have thrown around have been realistic, such as Gunter Brewer, a former wide-receivers coach at Marshall and Oklahoma State before becoming the receivers coach and “co-offensive coordinator” for the North Carolina Tar Heels. 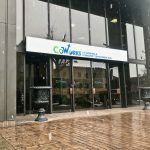 Brewer’s a top-level recruiter and exceptional at developing talent. 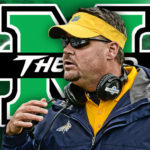 During his time as the Marshall receivers coach from 1996-1999 he directly coached names like Randy Moss, Nate Poole, and James Williams, all wide outs that went on to NFL careers. At his other stops, Brewer has continued to bring in and develop top-flight receiver talent, including NFL players like Justin Blackmon and Dez Bryant at Oklahoma State and West Virginia native Ryan Switzer at North Carolina. Brewer’s co-offensive coordinator tag is mostly a nominal title as Chris Kapilovic, handles play calling duties for the Tar Heels. Kapilovic is also the team’s associate head coach, so Brewer could see the Marshall job as an opportunity to implement his own offense and call his own shots. That along with his ties to Marshall make him one of the realistic fan suggestions. 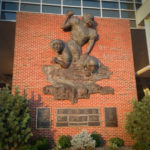 But, the fans have also thrown around some unrealistic options as well such as former Marshall quarterbacks Chad Pennington and Byron Leftwich. Pennington has publicly stated more than once that he has no desire to coach beyond the high school and youth league level. While Leftwich, who is currently the QB coach for the Arizona Cardinals, is being groomed for an NFL head coaching position by current Cardinals head coach Bruce Arians. That would make it seem as if Leftwich would be a long shot. 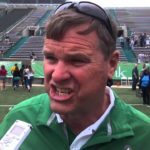 But, no matter who takes the reigns to the Thundering Herd offense, they won’t find the cupboard bare. The Herd offense brings back an offensive line that was young in 2017 but mostly effective. Marshall struggled at times to consistently move opposing teams off the ball in the running game, but the young o-line was one of the best in the country in pass protection, allowing only 11 sacks all season. With another year in the weight room, an O-line dominated by player’s who were freshman should only improve in the run game and be one of the team’s biggest strengths in 2018. Marshall also brings back a pair of running backs that combined for 1,632 yards and 13 touchdowns. Tyler King and Keion Davis complimented each other perfectly with Davis providing the power while King provided an elusiveness that very few backs have. Both players averaged more than 4.5 yards per carry in 2017. The receiving core also returns its top three playmakers in Tyre Brady, Marcel Williams and Willie Johnson. The group was banged up for parts of 2017 with each receiver missing at least one full game due to injury. Still, the trio managed to rack up a combined 1,897 yards and 14 touchdowns led by Brady’s 942 yards and eight scoring grabs. 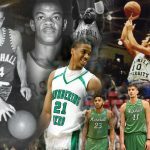 If fully healthy in 2018, that trio has the chance to be the best Herd wide receiving core since the days of Darius Watts, Josh Davis, and Denero Marriott. Especially when you add in the services of Oklahoma State transfer Obi Obialo, who wasn’t eligible for the first half of the 2017 season due to his own injuries. Obialo really came on strong in the team’s last few games as other receivers went down and missed games. He caught 19 balls for 238 yards making him a reliable fourth addition to the wide receiver group. 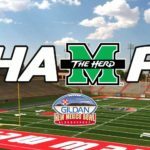 Marshall will have to find a way to replace tight end Ryan Yurachek, one of the most prolific tight ends in school history. During his senior campaign Yurachek made 54 grabs, the second most on the team, for 490 yards and a team leading 10 touchdowns. For his career Yurachek will finish in a tie for fourth with former Herd great Mike Barber on the receiving touchdown list with 26 TD grabs, the second most for a tight end in Marshall history. But, the new OC won’t have to go far to find experience at the quarterback position. 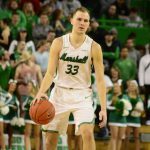 Chase Litton, a three-year starter for the Herd, will be back for his senior season. As a junior Litton threw for a career high 3,115 yards and 25 touchdowns, however, he also threw for a career high 15 interceptions. 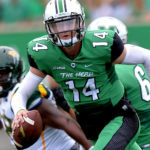 Eight of those interceptions came in the Herd’s five losses and going into his final season with the team, Litton, will be looked to for better decision-making. But, still his talent is undeniable. Litton has a big arm and an NFL ready body at 6-6, 232 pounds. So there is plenty to like if you’re a new offensive coordinator looking to make a splash in your first season with a team. 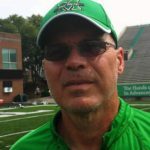 It’ll be interesting to see who coach Doc Holliday snags for the job, but whoever gets it will have plenty of weapons at the disposal to turn around a Marshall offense that had grown stagnant the last couple of seasons.